The sweet floral scent of gardenia’s delicate white petals is calming, restful and mood-lifting. Delicious and hypnotic, we’ve captured this exquisite fragrance in our room diffuser for you to enjoy in the home or gift to a loved one. Gardenia scent is extracted by a labour-intensive process that takes a lot of effort and time to produce just a small amount of precious liquid. The process is certainly worth it for the stunning, long-lasting fragrance and many benefits that this incredible scent has to offer. Gardenia is used to sedate, calm anxieties, relieve headaches and reduce nervous tension. 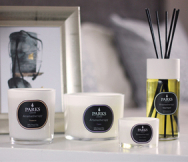 Its heavenly fragrance creates tranquillity in your home, transforming any room into a relaxing sanctuary. Kick back and unwind as this captivating aroma fills the room, lifts your mood and melts away the stresses and strains of a difficult day. Our 100ml diffuser is designed to provide between six and eight weeks of captivating scent. We use the finest scents, carefully blended together without any additives for intense long-lasting beautiful fragrance. Our natural room diffusers sets are a preferred choice to other synthetic options on the market, such as mainstream air fragrance diffusers. Although marketed as the ‘scents of nature’, many of these products release toxic industrial chemicals into the air which are best avoided. Presented in our attractive stylish gift box, this is the ideal present for loved ones who would benefit from some much-needed rest and relaxation.